Pork knocker Michael Jackson was on Monday charged once again with stealing from a house. 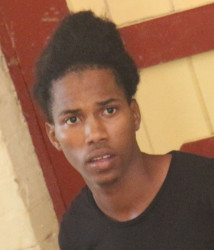 Jackson, of Three Miles, Potaro Road, was read a charge which alleged that between April 16 and April 17, at Three and a Half Miles, Bartica, Potaro Road, he broke and entered the dwelling house of Felicia Jones and stole jewellery and a tablet amounting to a total of $131,000. Prosecutor Neville Jeffers told a city court yesterday that the tablet was found on Jackson, while the other items have not been recovered. He further stated that Jackson has several other matters of a similar nature at the Bartica Magistrate’s Court. As a result, Chief Magistrate Ann McLennan remanded the 21-year-old accused and adjourned the matter to May 11, when it will be heard at the Bartica Magistrate’s Court. Jackson was charged on March 1 with stealing almost $1 million in cash from a dwelling house on February 27. He was subsequently released on $100,000 bail in the case.